What you need to know about Abortion in South Africa. These guidelines were developed by the Critical Studies in Sexualities and Reproduction (CSSR) research unit of Rhodes University and the Sexual and Reproductive Justice Coalition (SRJC). 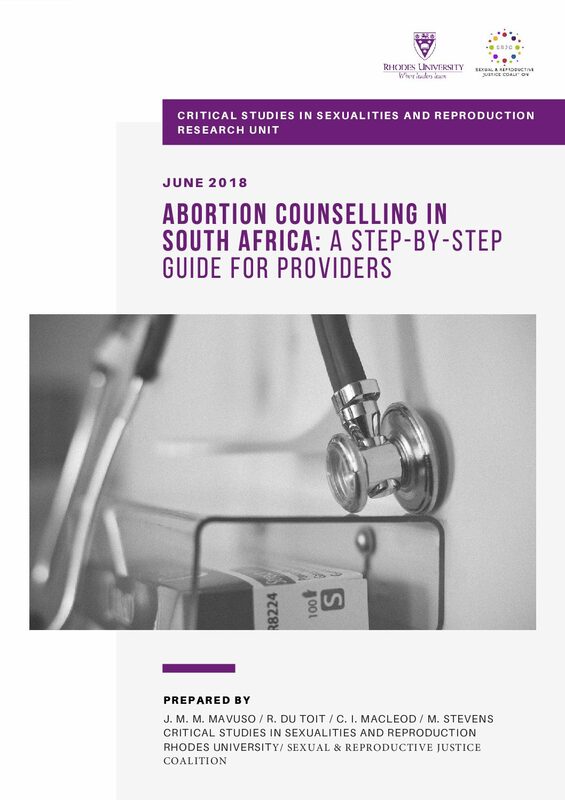 This step-by-step guide is based on research conducted by the CSSR on current abortion counselling practices in South Africa as well as the academic literature on abortion counselling. The research included recording of sessions, and interviewing healthcare providers and patients about the counselling sessions. A policy brief based on this research may be obtained at the following website. An electronic form of these guidelines may also be downloaded from this site. Cope, J. (1993). A matter of choice: Abortion law reform in apartheid South Africa. Dickson, K. E., Jewkes, R. K., Brown, H., Levin, J. Rees, H. & Mavuya, L. (2003). Abortion service provision in South Africa three years after liberalization of the law. Africa. South African Journal of Ethnology, 21(4), 203 – 206. Moral concerns and emotional experiences among black South African adolescents. Drower, S. J., & Nash, E. S. (1978). Therapeutic abortion on psychiatric grounds. South African Medical Journal, 54, 604-608. Haroz, A. E. (1997). South Africa’s 1996 choice on termination of pregnancy act: Expanding choice and international human rights to black South African women. Vanderbilt Journal of Transnational Law, 862-903. Harries, J. (2009). Termination of pregnancy services in South Africa: Implications for health service providers. Continuing Medical Education, 27(10), 463-464. Macleod, C. (2012). Feminist Health Psychology and abortion: towards a politics of transversal relations of commonality. In C. Horrocks and S. Johnson (Eds. ), Advances in Health Psychology (pp. 153-168). Basingstoke: Palgrave Macmillan. Manabolo, L. R. C., Tjallinks, J. E. (2010). Experiences of registered nurses at one community health centre near Pretoria providing termination of pregnancy services. Africa Journal of Nursing and Midwifery, 12 (1),73-86. McGill, J. (2006). . Journal for Christian Scholarship, 195-222. Morroni, C., & Moodley, J. (2006). Characteristics of women booking for first and second trimester abortions at public sector clinics in Cape Town. SAJOG, 12(2), 81-82. Ngwena, C. (2004a). Access to legal abortion: Developments in Africa. South African Public Law, 19(2), 328-350. Rossouw, J. P. H., & du Plessis, G. E. (1994). Unwanted fertility, contraception and induced abortion in South Africa. South African Journal of Demography, 4(1), 12-28. Blanchard, K., Fonn, S., & Xaba, M. (2003). Abortion law in South Africa: Passage of a progressive law and challenges for implementation. Gaceta Me’dica de Me’xico, 139, 109–114. Dickson-Tetteh, K., Brown, H., Rees, H., Gumede, T., Mavuya, L., Jewkes, R., et al. (2002). An evaluation of the implementation of the Choice on Termination of Pregnancy Act, South Africa 2000. Reproductive Health Research Unit. Pretoria: Department of Health. Varkey, S. J. (2000). Abortion services in South Africa: Available yet not accessible to all. International Family Planning Perspectives, 26, 87–88. University male students concerning the termination of pregnancy. Unpublished. South Africa: Rhodes University, Grahamstown. Bowes, T., & Macleod, C. (2006). The Characteristics of Women Seeking Termination of Pregnancy at an Urban Based Government Hospital in the Eastern Cape. Curationis, 29(4), 8-12. Olivier, M. A. J., & Bloem, S. (2004). 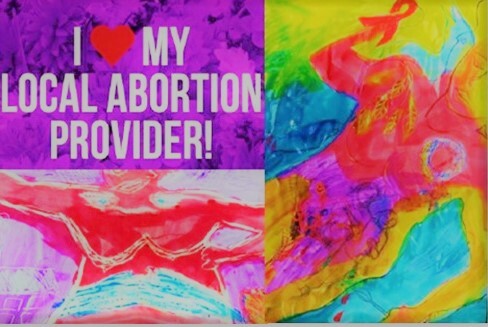 Teachers Speak their Minds about Abortion during Adolescence. South African Journal of Education, 24(3), 177-182. Bateman C. 2000. ‘Abortion: damned if you do or you don’t’ South African Medical Journal, 90: 750-751.
Cooper et al, 2005. ‘Medical abortion: The possibilities for introduction in the public sector in South Africa’ Reproductive Health Matters, 13,26: 35-43.
de Pinho H. and McIntyre D. 1997. Cost analysis of abortions performed in the public health sector. Cape Town, South Africa: Department of Community Health and University of Cape Town, 1997, pp. 1-33. Grelewicks L. 2011. ‘Equality and Abortion in Post-Apartheid South Africa: Inspiration for Choice Advocates in the United States’ Oregon Law of International Law, 13: 177-195. Hord, C. E. and Xaba, M. 2001. Abortion law reform in South Africa: Report of a study tour, May 13-19 2001. Johannesburg Ipas: South Africa. Warriner et al, 2006. ‘Rates of complication in first-trimester manual vacuum aspiration abortion done by doctors and mid-level providers in South Africa and Vietnam: a randomised controlled equivalence trial’ The Lancet, 368: 1965-1972. Wheeler et al, 2012. ‘Attitudes and Intentions Regarding Abortion Provision Among Medical School Students in South Africa’ International Perspectives on Sexual and Reproductive Health, 38,3: 154-163. Blanchard K, Cooper D, Dickson K, Cullingworth L, Mavimbela N, von Mollendorf, C, van Bogaert, LJ, Winikoff, B. 2007. A comparison of women’s, providers’ and ultrasound assessments of pregnancy duration among termination of pregnancy clients in South Africa. BJOG An International Journal of Obstetrics and Gynaecology. 114(5): 569-575. Blanchard K, Schaffer K, McLeod S, and Winikoff B. 2006. Medication abortion in the private sector in South Africa. The European Journal of Contraception and Reproductive Health Care. 11(4): 285-290. Buchman E, Kunene B, Pattinson R. 2008. Legalized pregnancy termination and septic abortion mortality in South Africa. International Journal of Gynecology & Obstetrics. 101(2): 191-192. Hoffman M, Moodley J, Cooper D, Harries J, Morroni C, Orner P, Constant D, Matthews C. 2006. The status of legal termination of pregnancy in South Africa. South African Medical Journal. 96(10): 1056. Jewkes R, Rees H, Dickson K, Brown H, Levin J. 2005a. The impact of age on the epidemiology of incomplete abortions in South Africa after legislative change. BJOG: An International Journal of Obstetrics and Gynecology. 112: 355-359. Kawonga M, Blanchard K, Cooper D, Cullingworth L, Dickson K, Harrison, T, von Mollendork C, Winikoff B. 2008. Integrating medical abortion into safe abortion services: experience from three pilot sites in South Africa. Journal of Family Planning and Reproductive Health Care. 34(3): 159-164. Cox, P. (2005). A feminist anthropology of barriers to implementing the Choice on Termination of Pregnancy Act (CTOP). Unpublished master‟s thesis, University of Cape Town. Retrieved January 26, 2010 from University of Cape Town Library. Dearham, A., Arends, E., Gebhardt, S., Alblas, M., Naledi, T., & Titus, S. et al. (2009). A rapid appraisal of termination of pregnancy services in public health facilities in the Western Cape Province, South Africa. Unpublished electronic report, School of Public Health and Family Medicine, University of Cape Town. Engelbrecht, M. (2005). Termination of pregnancy policy and services: an appraisal of the implementation and operation of the Choice on Termination of Pregnancy Act (92 of 1996). Unpublished doctoral thesis, University of the Free Sate. Retrieved February 12, 2010, from University of Cape Town Library. Klugman, B., & Varkey, S.J. (2001). From policy development to policy implementation: the South African Choice on Termination of Pregnancy Act. In B. Klugman & D.Budlender (Eds. ), Advocating for abortion access: Eleven country studies (pp. 251-282). Johannesburg: Witwatersrand University Press. Mitchell, E., Trueman, K., Gabriel, M., Fine, A., & Manentsa, N. (2005). Accelerating the pace of progress in South Africa. An evaluation of the impact of values clarification workshops on termination of pregnancy access in Limpopo Province. Johannesburg, South Africa: Ipas. Adanlawo, M & Moodley, J. 1999. Demography and social profile of women requesting termination of pregnancy in King Edward the VIII Hospital. South African Journal of Epidemiology Infections, 14(4):99-102. Kay et al, 1997. ‘An analysis of the cost of incomplete abortion to the public health sector in South Africa-1994’ South African Medical Journal, 87: 442-447.